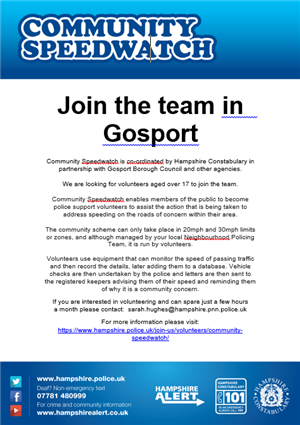 Community Speedwatch is looking for volunteers in Gosport. If you are aged 17 or over, you could join the team and assist in tackling speeding on roads in the areas which matter to you. If you are interested and can spare just a few hours a month, please email PCSO Sarah Hughes at sarah.hughes@hampshire.pnn.police.uk.